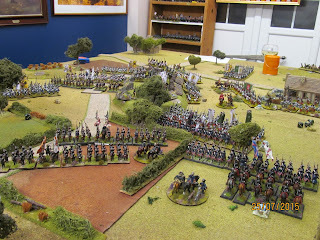 This Saturday's game with Peter takes me back on track for my project to refight the main, i.e. 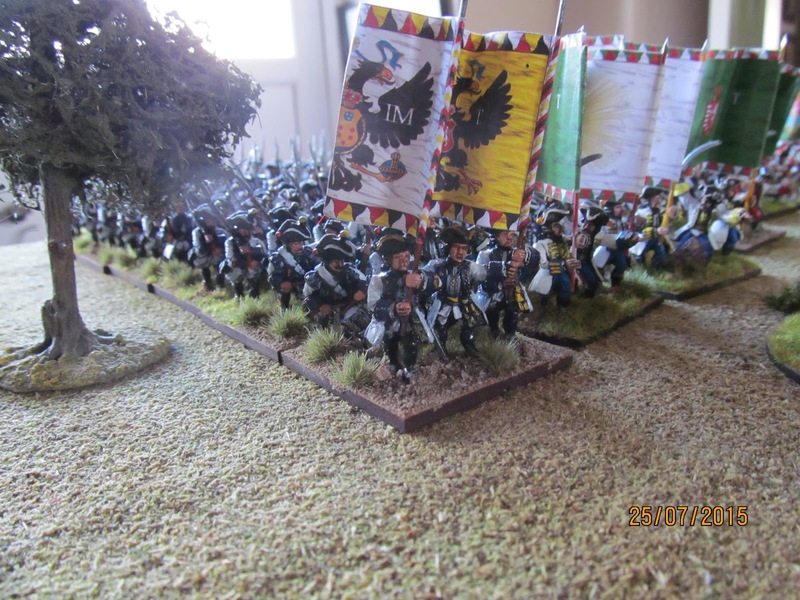 in my case Prussians v the rest, delete as applicable, battles of the SYW, with the Austrian attack on Winterfeld's exposed corps on the right bank (or the wrong bank?) 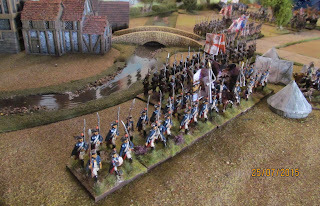 of the River Neisse at Moys, led by General Nadasdy. The Prussians were outnumbered significantly but in the real battle managed to withdraw, though not without loss, after inflicting a bit of a bloody nose on the Austrians who did not exploit their victory. 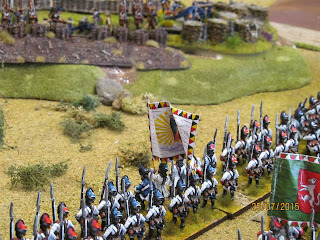 The terrain was greatly simplified for the game, and the armies were very roughly represented on a 1 war-games unit to 2 historical units. 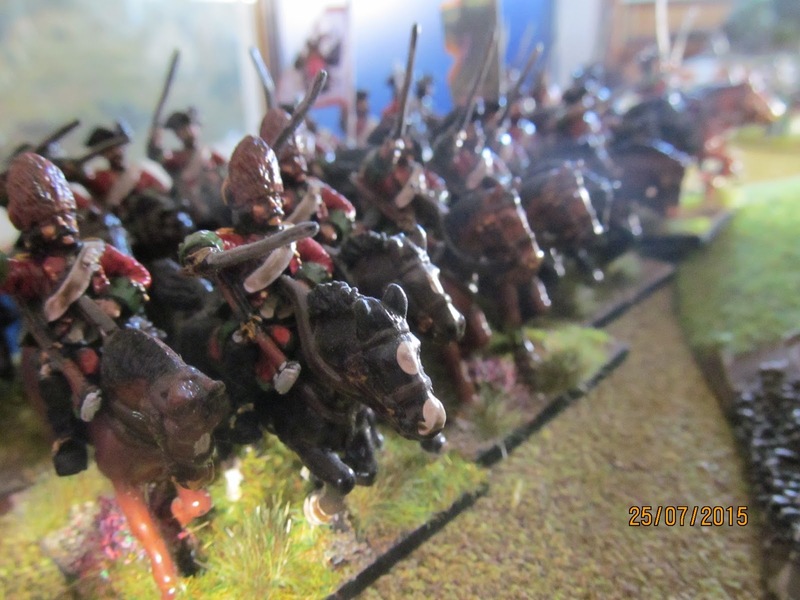 This may have favoured the Prussians slightly but then I could always re-cycle the Austrian infantry if necessary. 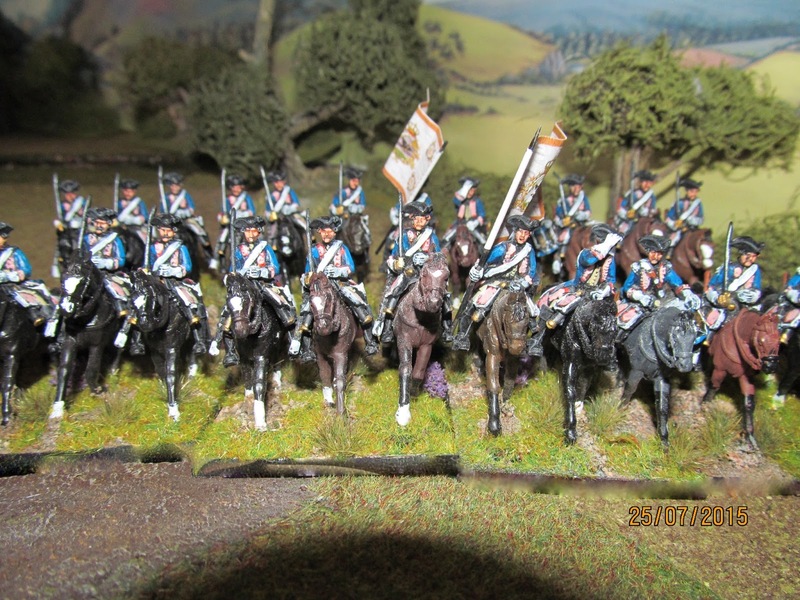 Infantry units are 36 figures and cavalry regiments 24, in two squadrons of 12. 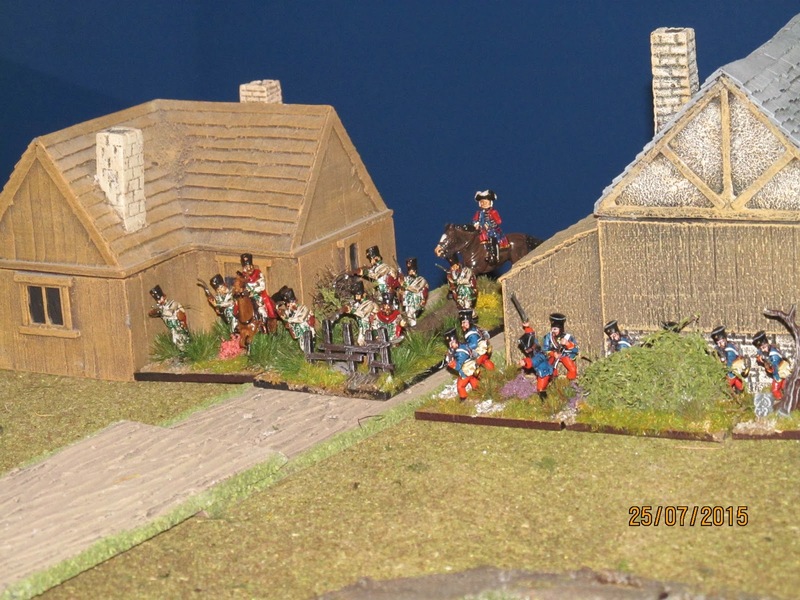 As always we used Black Powder and the LAoK supplement, suitably tweaked for the scenario. 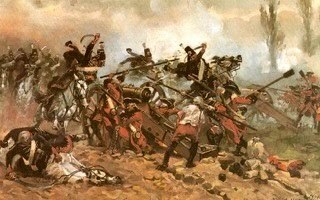 Left wing, Major General Normann (8): 1 grenadier btn, 1 sqdn of cuirassiers, 1 sqdn of hussars, 1 regt of dragoons. 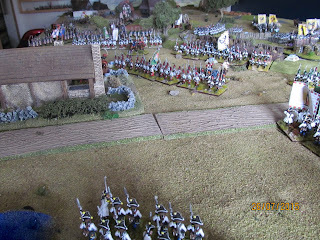 The Austrians started with one battery and the troops of Arenberg and Pfalfy on the table. 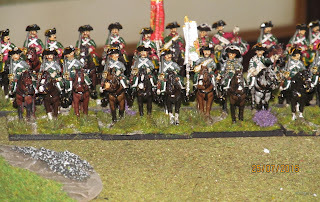 Nostitz's cavalry is just off table between Leopoldshayn and Hermsdorf, and would only appear if the Prussians under Normann move to support their comrades in the centre, or if the Austrians decided to employ them more aggressively than in the actual battle. 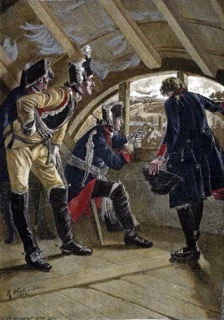 The Grenz were occupying Leopoldshayn. 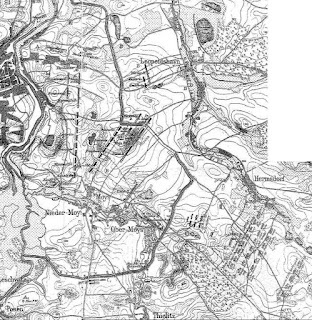 The remaining Austrians would appear in column on the turn indicated. 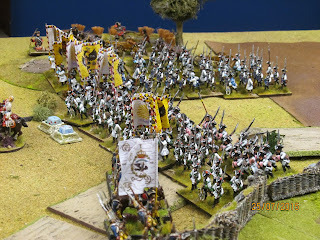 As stated the command of Normann dared not move to help the troops in the centre or Nostitz's brigade would be released. If they were attacked by any other Austrians, or Nostitz decided to engage, they would of course react and they were free to attack Leoplodshayn in any case. 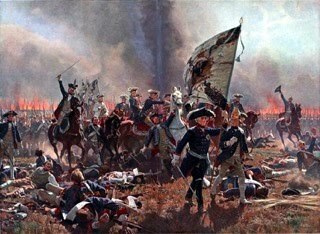 Kannacher's brigade was only allowed to form up once the assault on the Jagerlsberg had begun. 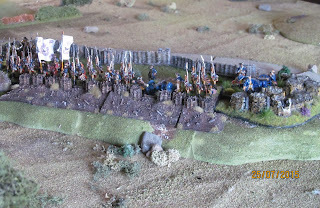 The battalion in Moys was able move to support the grenadiers in the earthworks from T1. 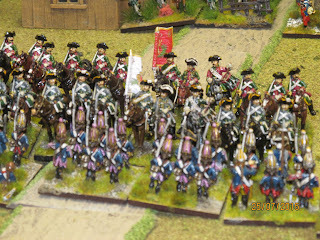 Peter wanted to play the Austrians which was fine by me. 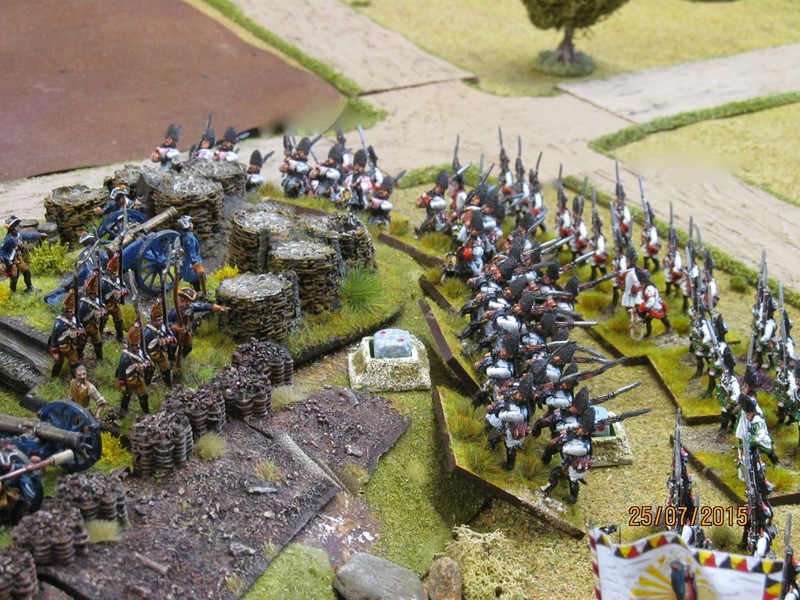 Above and below, the Prussians on the Jakelsberg stand to arms and await the Austrian attack. 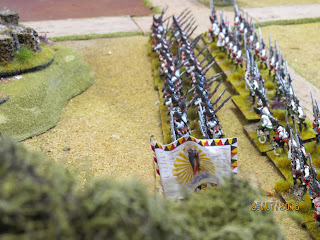 The Prussian main body under Kannacher took their time forming up but eventually managed to shake themselves into line. 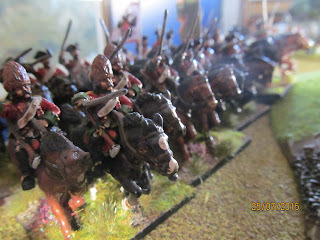 The Prussian main body was also wary of the mass of Austrian and Saxon cavalry that was just off table to their left. 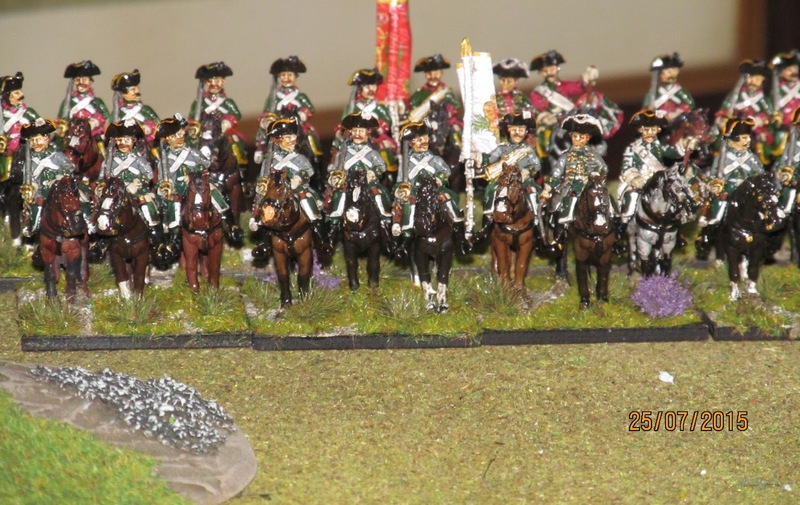 Pictured are the Saxon cheveauxleger regiments Prinz Albrecht and Prinz Karl. Grenzers occupying the village of Leopoldshayn. 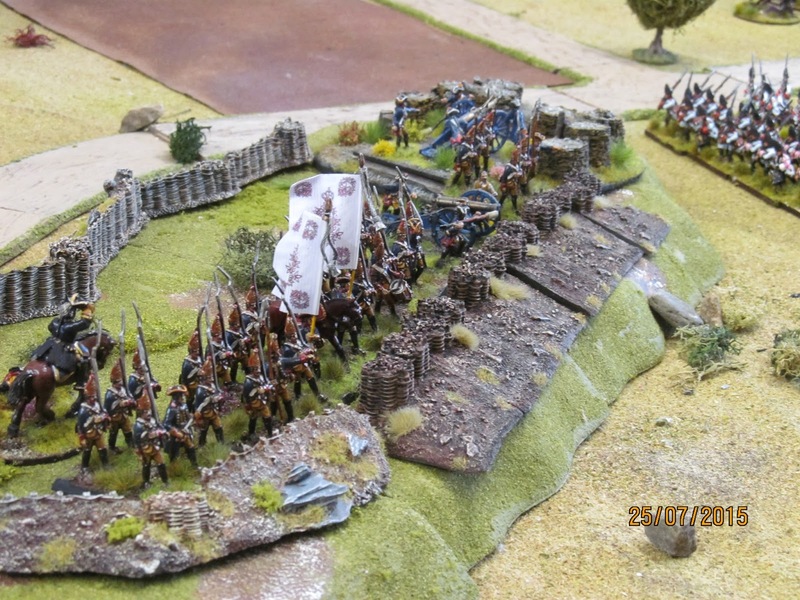 Three massive Austrian columns advancing towards the exposed Prussian entrenchment. The C.O. of the Prinz Albrecht cheveauxlegers ponders whether to ignore his orders and attack the Prussians to try and cut them off from the bridge. 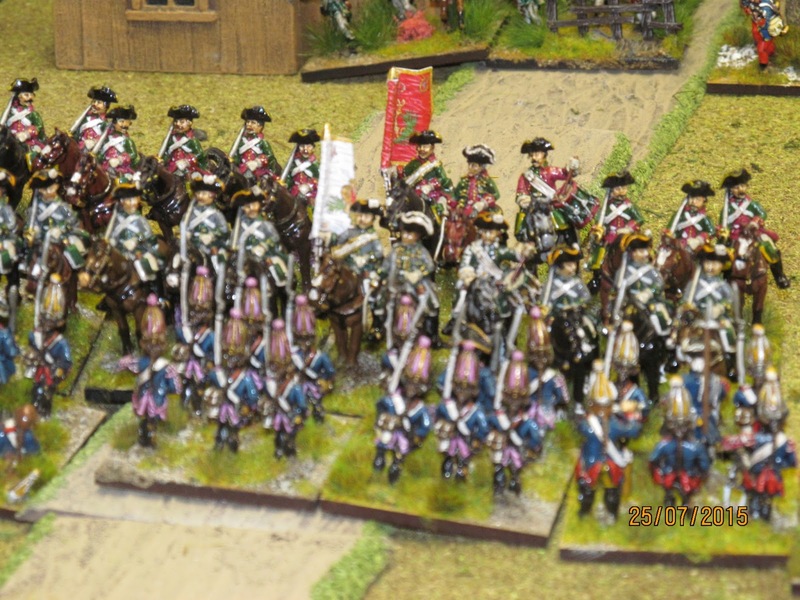 The Austrian Hessen-Darmstadt dragoons advance onto the table. 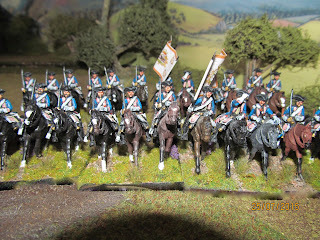 Prussian dragoon regiment No. 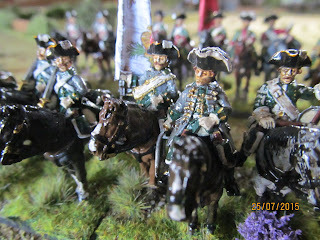 3 Truchseß Graf zu Waldenburg poised to hold back the advancing Austrian and Saxon cavalry. 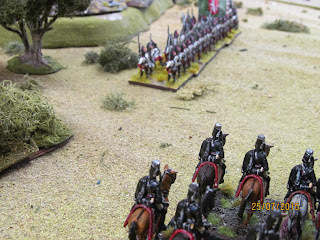 They tried but were driven from the field. 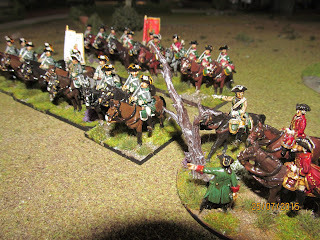 New unit, fought in two battles, broken in both battles! Mmmm? Above and below, the Grenzers begin taking pot shots at the Prussians and became such a nuisance that I ordered the grenadier battalion posted on the left flank in support of my cavalry to assault the village. They failed to dislodge the Grenzers and had to withdraw. 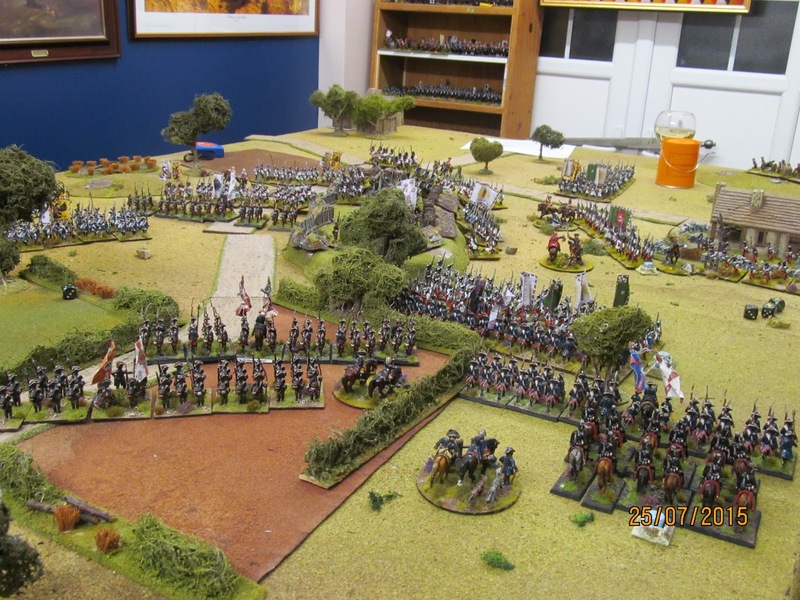 The Hessen-Darmstadt dragoons enter the fray and charge the Prussian cavalry while below, the second of the Austrian columns advances down the right flank, thankfully for me and the Prussians their progress was slow. 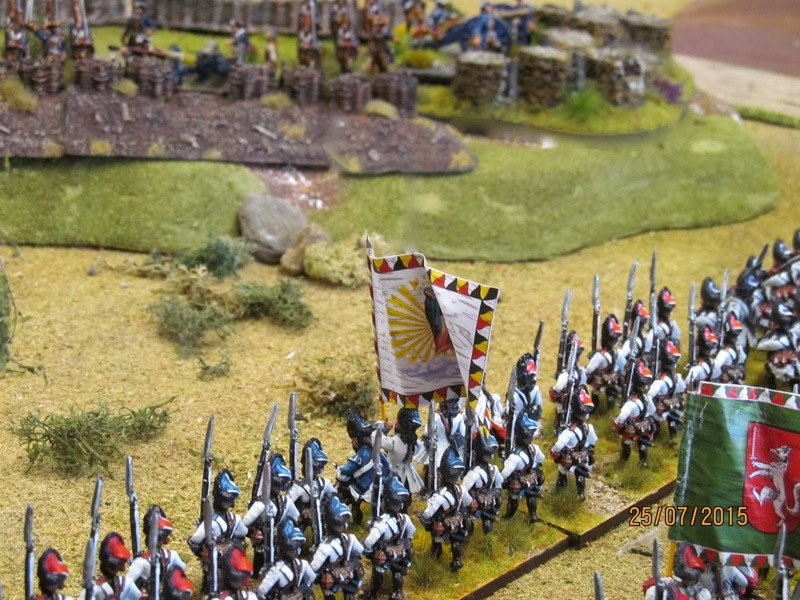 Above and below; Austrian grenadiers of Arenberg's command assault the Prussians entrenched on the Jakelsberg, taking light casualties thanks to some rubbish throws from me and some good saves by Peter. 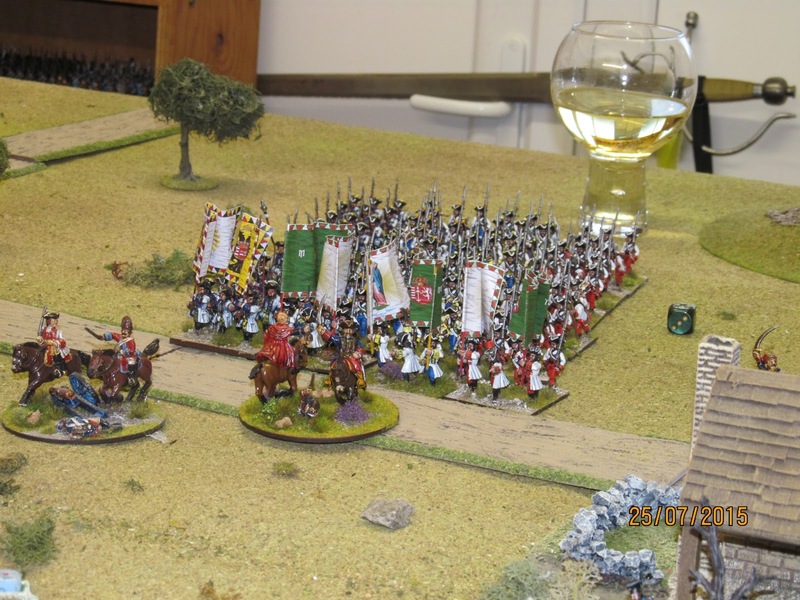 Above and below, two battalions of Austrian grenadiers deploy in order to assault the earthworks from two directions, while below, my hussars eying up a nice juicy target. 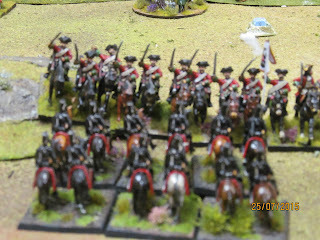 Sadly for them Peter's hussars charged mine to try and save the grenadiers. His cavalry were defeated by the hard-fighting Prussian hussars who then swept forward into the flank of the Austrian grenadiers. These were made of sterner stuff and my hussars were unable to break into their formation and were forced to retire shaken. The Austrians made heavy going of their assault (in the rules its very hard to dislodge formed and unshaken entrenched troops, as it should be). One battalion was forced back but weight of numbers would surely tell? 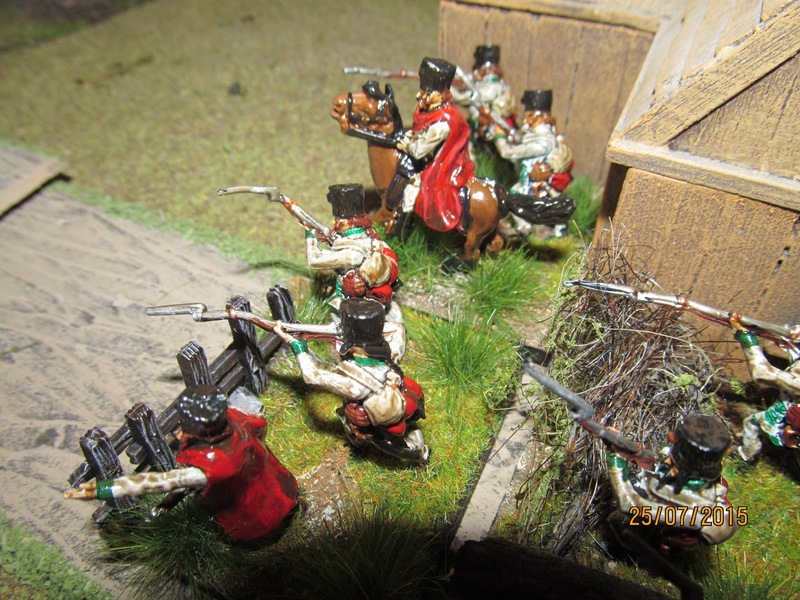 Above, the second Austrian column moves round the hill to try and cut off the Prussians. 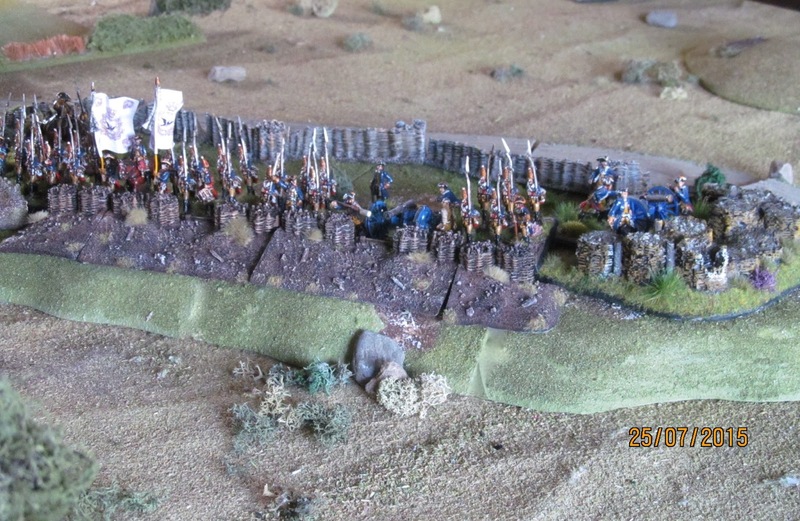 I'd managed to push the grenadier battalion from Moys into the entrenchments to strengthen the garrison. 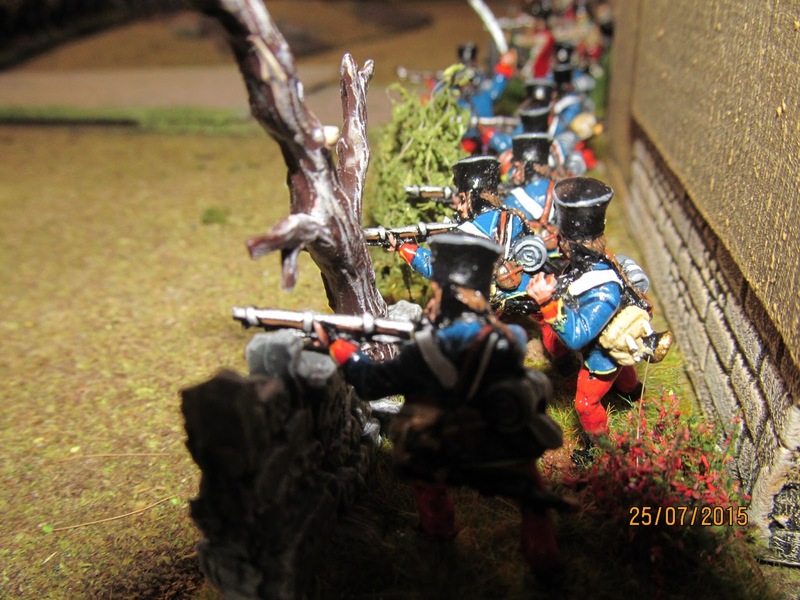 The third and final Austrian column arrives. Were they delayed by the Prussian cunningly placed wine glass? 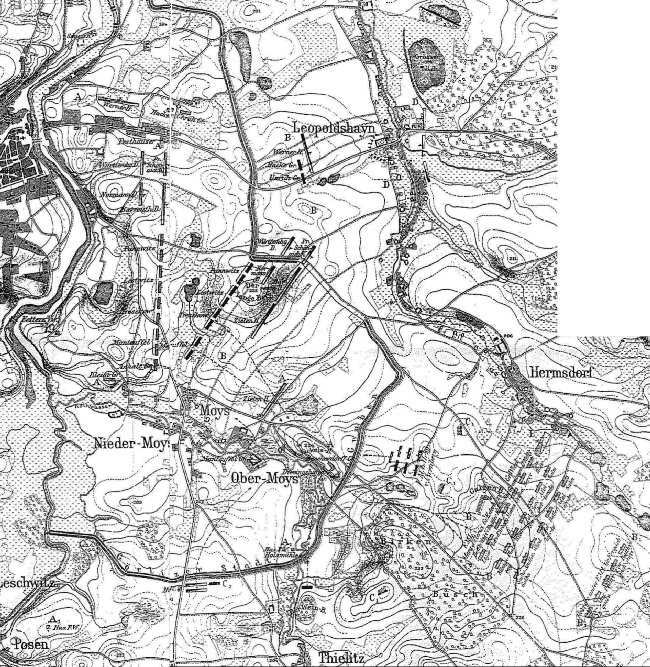 Finally the Austrians break into earthworks, destroying the gun and driving one battalion of grenadiers out of the works. 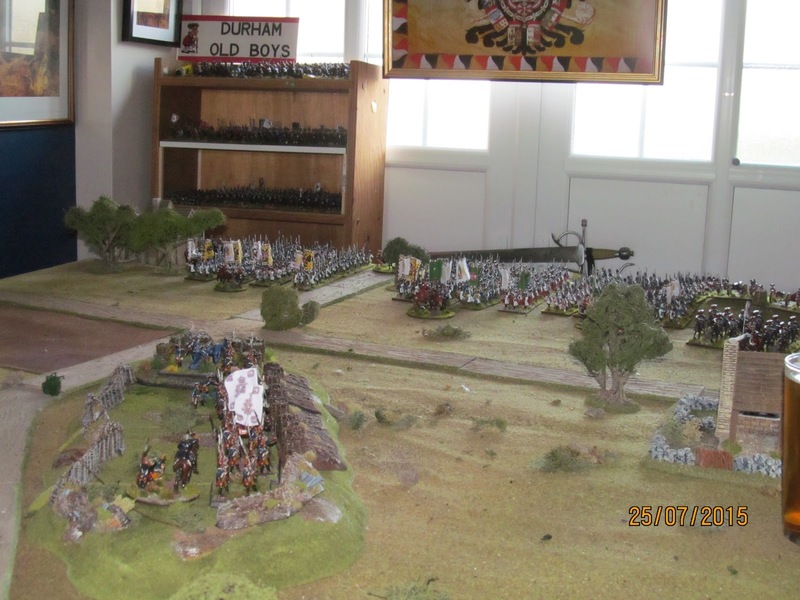 I get to use my new vignette too. 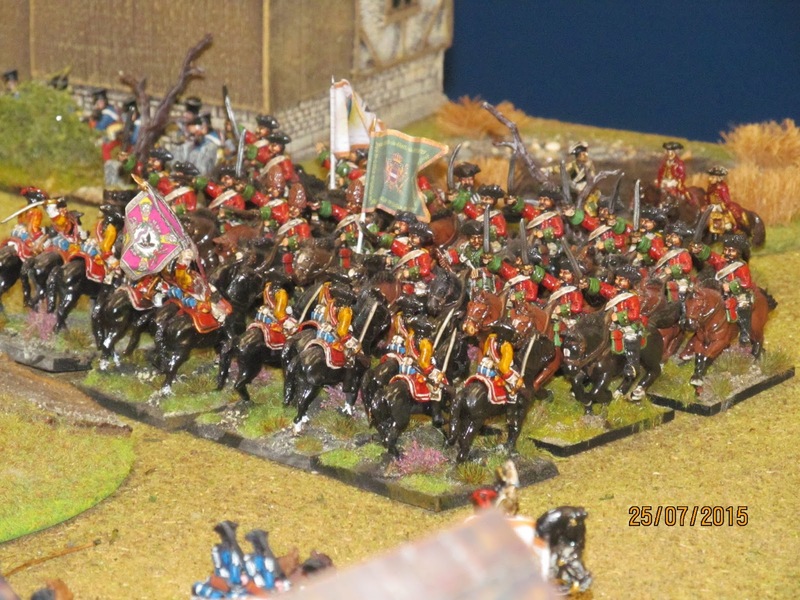 Above, Austrian dragoons clash with my Prussian cuirassiers. The latter managed to break to first squadron, and follow up into the second but they were unable to do much damage and were forced to retreat shaken. 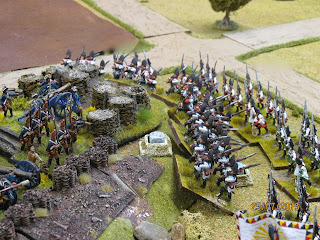 The battlefield as the Austrians capture the earthworks. 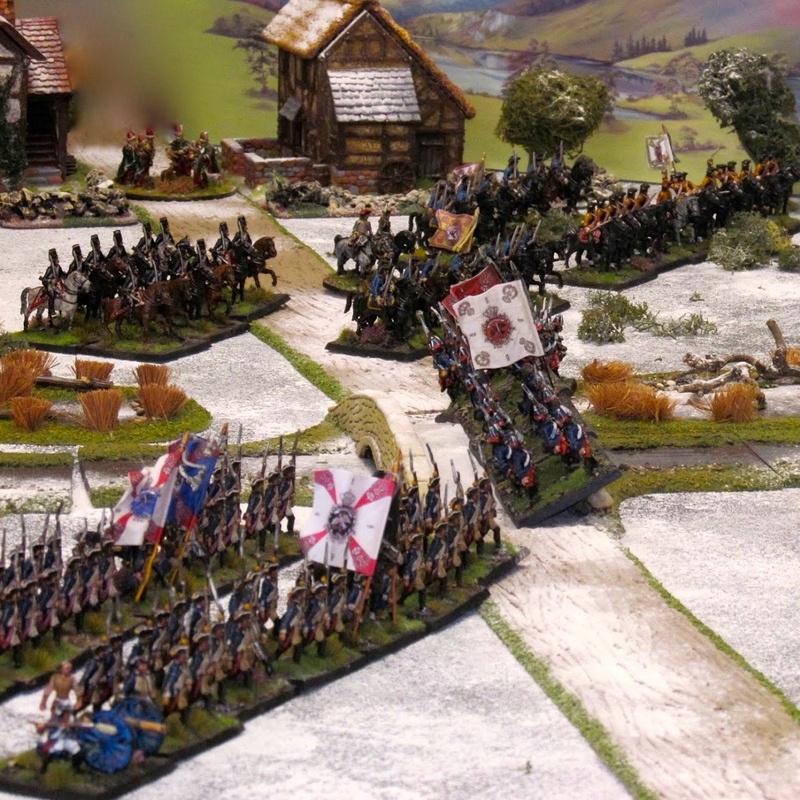 Overwhelming numbers of Austrians are deploying menacingly (or whatever passes as menacing for Austrians). The Prussian main body has finally come up, although I was very wary of the Austrian cavalry entering the table on my flank. 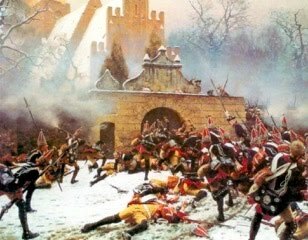 Peter tried to drive off the Prussians on the right of the picture with a series of bayonet charges but they failed to dislodge the Prussians. My remaining squadron of hussars is charged by the surviving but damaged squadron of Austrian dragoons. 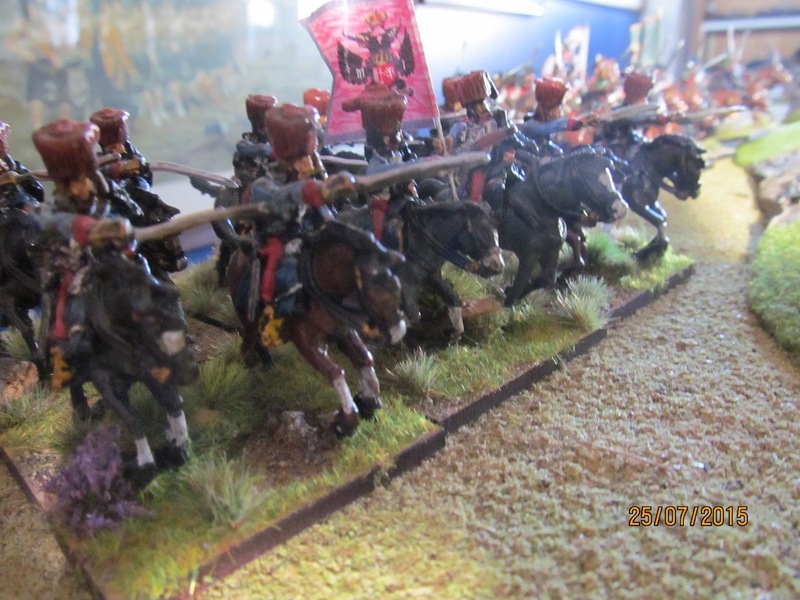 Amazingly, although shaken in the process, the hussars were able to break the dragoons. 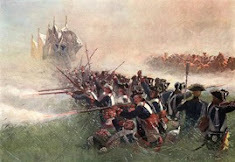 As the battle closed the Prussians were able to retreat in the face of the advancing Austrians. With little cavalry left they were unable to prevent a safe Prussian withdrawal over the bridge. 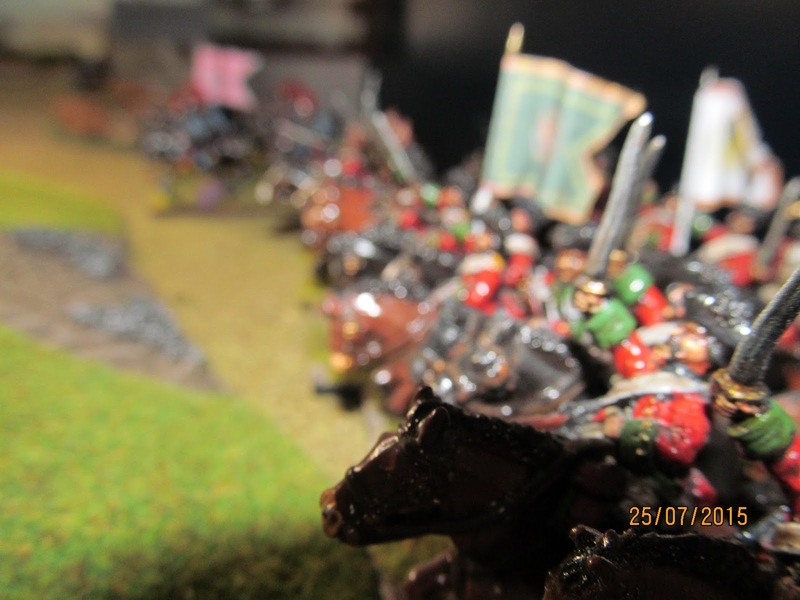 The broken Saxon cavalry file past their commander in shame. So, game over. 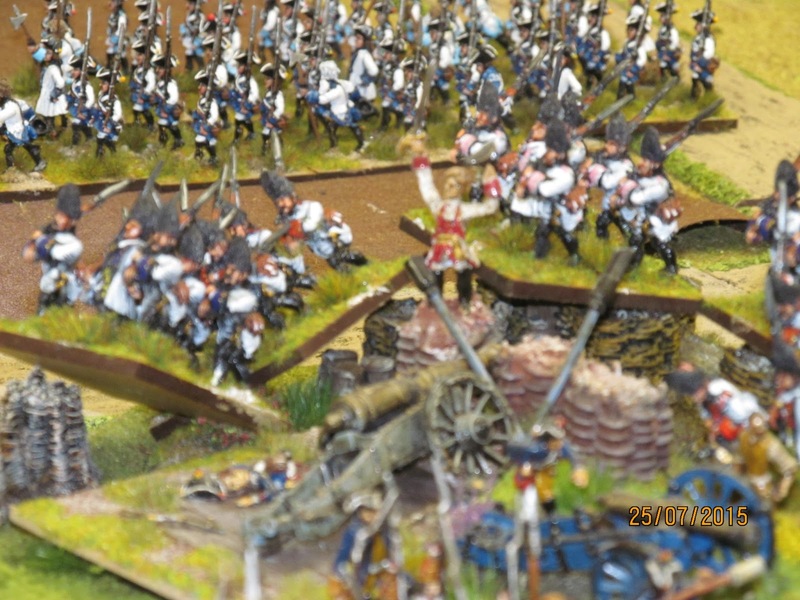 The outcome was as expected and according to history, but I was very pleased with the Prussian's performance. 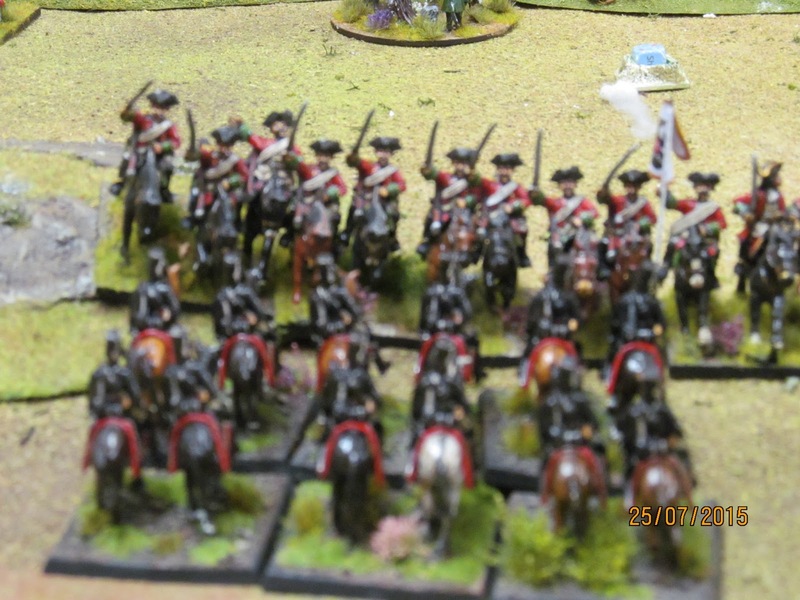 Peter took a chance in bringing his cavalry on rather than just keeping them off table thus pinning my cavalry and it didn't really pay off, especially as we forgot to bring on one unit of combined horse grenadiers who might have made the difference! 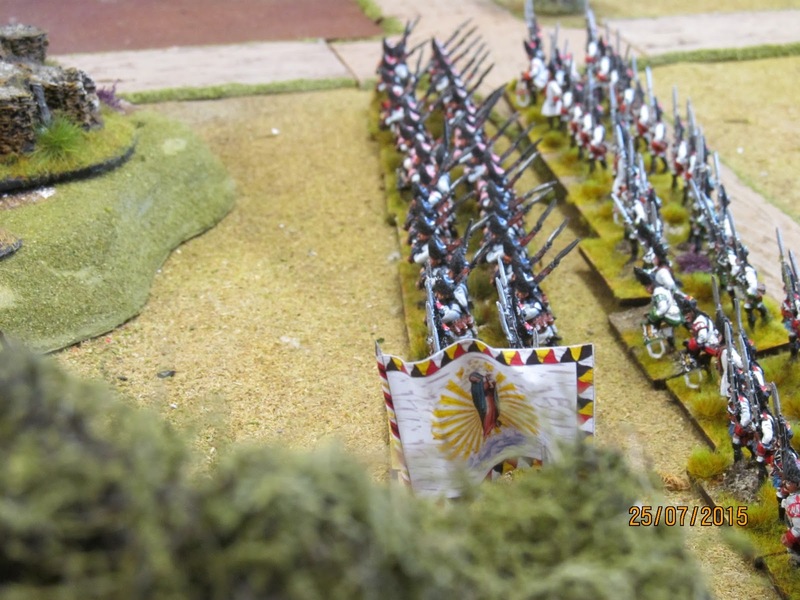 Then again, the brigade was quickly spent with over half of its units shaken or broken, therefore they would have had to withdraw. 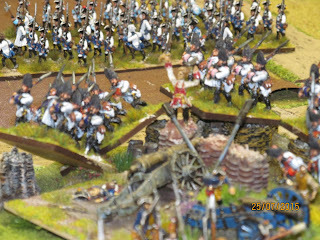 The fight for the entrenchment held the Austrians up as they were unable to do much damage on the defenders by shooting at them (other than to cause disorder) so swamping the defenders with waves of grenadiers was probably the best course of action, and it did work after a couple of moves of hard fighting to break into the entrenchment, at which point it was time for the Prussian survivors to get out a.s.a.p! 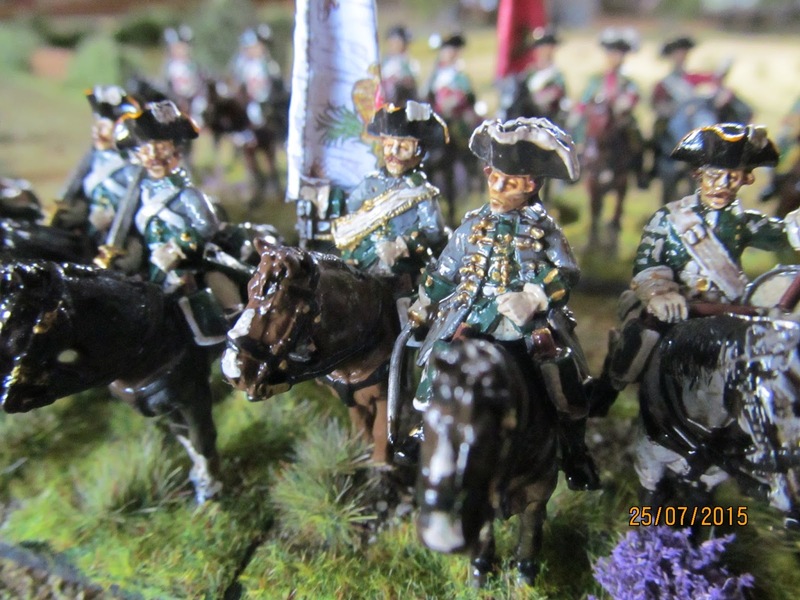 Historically the Prussians re-took the redoubt before loosing it a second time, and General Winterfelt was killed. In the game I didn't like the look of the odds so decided that as there was no chance of being cut off from the bridge if I withdrew there and then, so I legged it! 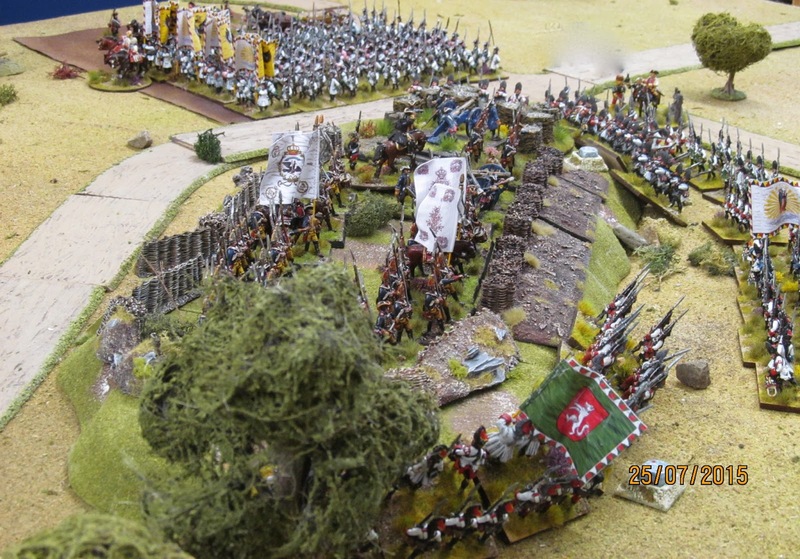 Always enjoy your battle reports, Colin! Another fine effort, so thanks! Excellent report Colin - very enjoyable.